A Crime That Shocked A City. . . In 1995, Austin, Texas was rocked by the brutal murder of a lesbian princess named Regina Hartwell. Even though Regina's body was burned beyond recognition, within days police had two suspects. One was the beautiful ex-cheerleader who was the object of Regina's desire. The other was a man who would take the fall for murder. . .
A Killer's Heinous Acts . . . In this new edition of her bestselling book Wasted, true crime master Suzy Spencer chronicles a fatal love triangle--and lives driven out of control by sexual desire, drugs, and shocking childhood demons. A Twisted Road To Justice. . .
Four years after Regina Hartwell's murder, a new charge was brought against one of her suspected killers. 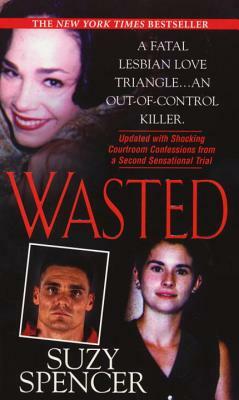 Now, Suzy Spencer adds a new chapter to Wasted--detailing a killer gone wild, a nerve-wracking legal standoff, the shocking twists that would take place in a second, explosive trial. . .
16 pages of shocking photos! Though a Texan by birth and by spirit, Suzy Spencer has spent her life exploring the world and it's peoples to prepare herself for a career as a writer. Spencer is the author of the extended New York Times bestseller Wasted -a true Texas tale about a rich lesbian, her beautiful young girlfriend and the killer who came between them. Clay Smith of the Austin Chronicle said that "Wasted is everything a true crime book should be: lean, fierce, and unsparing. It's factual, gory, and macabre." Spencer has led a very diverse life from working as a missionary in guerilla-attacked Malaysia and riot-riddled Detroit to interviewing Wall Street's and Washington's pacemakers as a Fortune Magazine reporter. She has also written about Hollywood's hottest as a free-lancer for People Magazine and Los Angeles Magazine. She has delved into the spheres of banking, jewelry, fashion, show biz, education and even social work in jobs ranging from marketing consultant, editor, secretary, manager, teacher and welfare worker. She's lived in New York, California, Michigan and Hawaii. And she's traveled throughout Europe, North America and the Far East. Spencer has also prepared herself academically with two graduate degrees from the University of Southern California (A Masters of Professional Writing and a Masters of Business Administration), and a bachelors degree from Baylor University with course work at the UCLA. She is the recipient of two Chilton Editorial Awards, three semi-final finishes in the Pirates' Alley Faulkner Awards, and one Austin Writers' League Word is Art award. Spencer currently lives in Austin, Texas where she is working on her next true crime book due out in the fall of 2000. Wasted is Spencer's salute to her many friends and family who have fought drug, alcohol, sexual, emotional and physical abuse, who have turned personal tragedies into triumphs, and who unceasingly exhibit that Texas spirit. If you would like to contact Suzy Spencer please send mail to PO Box 161732, Austin, TX 78716-1732.